This table consists of a three plank solid oak removable top of fine faded patina with cleated ends. This leads down to the base which consists of four baluster turned legs, these being joined by an H stretcher. 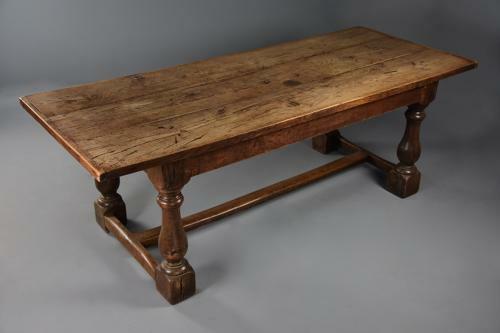 Later refectory tables such as this with the H stretcher can often be a more practical option than the older examples with the stretcher to the outside. This table is in very good condition for age, is of stable construction and can go straight into a home - this table should easily seat 10.